First thaw the frozen spinach and cook it in the microwave using a microwave safe vessel, for 6 mts. Take a wide pan, pre heat the oil, add mustard seeds, when it splutters add, urid dal, asafoetida powder, Red chillies(optional), green chillies, and fry it till it turns golden brown. Now add the chopped onion to it and cook it for another 2 mts. till the onion turns golden brown. Now add the spinach to it and mix it thoroughly. Now add salt and curry powder and cook it for another one minute. The ingredients should not be wet or watery. It should be dry, Now turn off the stove and sprinkle the coconut on top of it. Note:-We can also avoid using onion in this receipe. Can also use coconut oil instead of canola or olive oil. 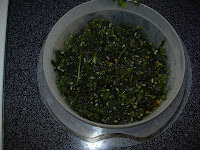 This curry will be a good side side for rice and this itself can be mixed with rice and we can have it as spinach rice. It will be really good and healthy. Try this and lemme know your comments.